Retired Major League pitcher Curt Schilling on Monday shared a picture on Twitter that suggested journalists should be lynched and called the image "awesome." 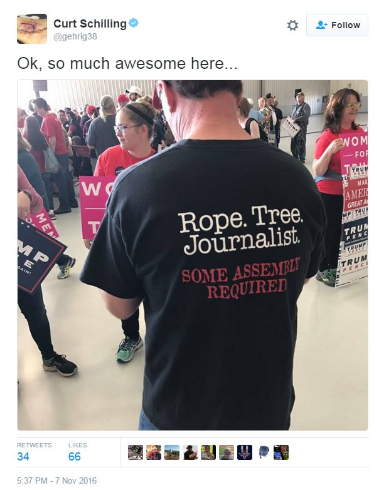 The photo was taken at a rally for Donald Trump, the Republican presidential nominee, and showed an individual wearing a shirt that read: "Rope. Tree. Journalist. Some assembly required." "OK, so much awesome here," Schilling wrote when tweeting the image. He later called the image "funny," said it displayed "sarcasm," and added that "if it offends" readers they should block him or "shut the hell up." Schilling, who led the Boston Red Sox to World Series championships in 2004 and 2007, has frequently espoused controversial right-wing views since retiring from baseball. He has mused about running for Senate in Massachusetts in 2018. He is a strong supporter of Trump and was fired from ESPN earlier this year after sharing a controversial meme on Facebook about transgender bathroom laws. Breitbart, a far-right news outlet, recently announced Schilling would host a radio show for the website. A representative for Breitbart did not immediately respond to a request for comment.